I finally found the beta version stable enough to be a release. The biggest added feature is the Stealth Auto-updater that will stop SoundSwitch, install the new version and restart it automatically without any user interaction. I implemented this feature because some user found the auto-update notification annoying. This feature is opt-out in the settings panel. Speaking of which, it got a little redesign to only keep the Hotkeys and the list of devices in the other tabs. Where is the exe file !?!? Something anoying for me is about the icon in the system bar. I put the icon in the hidden icons area, but when i switch the icon appears in the system bar again and i have to click on the arrow to hide it again. Do you understand what i am saying ? I understand. But no, I won’t add the possibility to disable the tray icon for SoundSwitch, some of the feature like Windows Notification are directly linked to that icon. If you don’t want the icon to appear on switching, you can choose another notification than the Windows one. Anyways, keep up the good job! I planned to “animate” the icon. But it’s really low on the priority list. I don’t think I’ll add a customization for the icon. But, after I install version 3.x (many years before I use v.2.) few problem appear. Every playback device that is in a certain period is not used goes in section Playback>Disconnected, but over and over again. After some time, list of (practically the same, repeated) disconnected device is huge. Moreover, unlike the previous version, now comes to the loss of devices for which there was no interruption in the use. For example, LCD TV which was selected as a sound source (and it constantly is), after restarting of the computer, is transferred to Playback>Disconnected section. Generally Windows assign a specific ID to a soundcard. This idea is not supposed to change when plugging/unplugging the device (like your TV). Could you try to update the drivers for your graphics card? If it’s a laptop, also update the one of the chipset (in case it’s Intel). I use latest nVidia graphics drivers. I have not mentioned that I use OS Windows 7 [x64], but I do not think that’s the problem. Moreover, my hardware with SoundSwitch version 2 worked flawlessly. Anyway, I would not want to create you additional headache 🙂 So, can I find somewhere latest SoundSwitch 2.x version? I was thinking of a solution to your problem, where instead of having to select which device you want, I could add a configuration checkbox to make SoundSwitch switch between all connected devices. In that case, it would resolve your issue. Like this, this issue will be easier to track for both of us. I am trying to determine if the software listed below are Windows 10 compatible. I did not find the necessary information on your website. Could you please advise if the software versions listed below are Windows 10 compatible? Any insight you can share would be greatly appreciated. 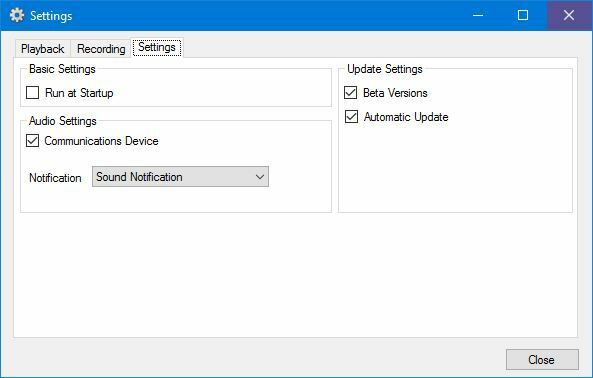 All version of SoundSwitch since the 3.0 are compatible with Windows 10.